Why Man City? I asked. Amra was born in Sarajevo, Bosnia. As her parents moved around, working, she lived in Pakistan, Syria and currently is in Montreal. Along the way, she picked up languages, as easily as I picked-up injuries in my amateur football career. 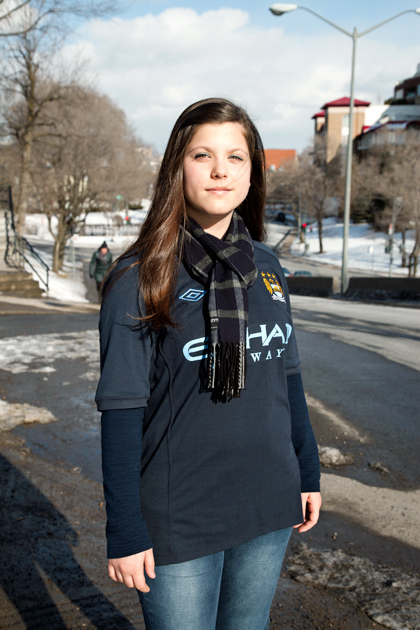 Amra is fluent in Bosnian, Arabic, English and French and she is only 15, a great student on top of it all. She is one of those kids, and there are more and more of them in these parts of the world, who live in the muliticultural and diverse world from the inside; multicultural and diverse they are from within and have no need for anyone to teach them about the existence of ‘others’. Borders, for Amra and those like her, are the things of the past. These young people are the future of this world. It can only get better, once they get a chance to redefine the way we live. Amra obviously loves Edin Džeko (another Bosnian kid who embraced the world) and, consequently, supports Manchester City. NEW Sports broadcasts on the internet as free TV. Tennis, hockey, football, each game http://www.info222.cz it’s good quality.